Neath Antiquarian Society | WAS NEATH WORTH ITS SALT? 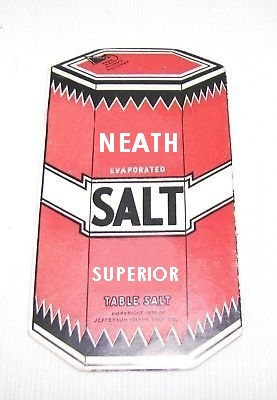 WAS NEATH WORTH ITS SALT? In exploring Neath's long industrial history you encounter the usual undertakings expected in this part of south Wales; coal mining, tinworks, steelworks, ironworks, copper refining, chemical works, brickworks and even a gunpowder works. Landowners, gentry and industrialists were always keen to speculate and invest in any venture that would turn a profit. It is, therefore, remarkable perhaps to discover that in the 1770s one of these was a salt works that was operating on The Green, Herbert Mackworth being the main investor. 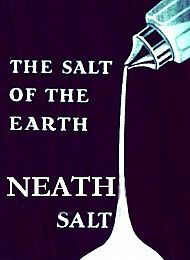 In essence salt is obtained either by mining or by the evaporation of seawater and it was this latter method that was being used at Neath. In warmer climes seawater can be contained in pools (known as salt pans) to be reduced by evaporation caused by the heat of the sun into brine. The brine then eventually dries out completely into salt crystals. Even with our British climate there are a few examples of coastal salt pans, such as at Salcoates in Ayrshire where in the 1500s, King James V financed the establishing of such an industry from which the town takes its name. Now, whilst seawater is reasonably close at hand, Neath is not known for a Mediterranean climate and so the heat had to come from other means (the introduction of an alternative form of heat to replace that of solar was a natural progression). What Mackworth did have was a plentiful supply of coal which could be burnt to provide the heat source for boiling pans. The liquid being evaporated was a mixture of seawater and rock salt. It is likely that the rock salt came from Cheshire, being the main area where it is mined in this country. The adding of rock salt was to make the seawater saltier and thereby the crystals formed. The workers at the salt works were classified as Baylers (presumably those who removed the crystals from the pans into the tuns (barrels), and smiths who again presumably constructed the boiling pans. The wages seem fair for the time. Lumpman: A lumpman would work on pans that made fine salt crystals, which were known as 'fine pans' or 'lump pans'. The quality of the salt depended on the state of the fires which crystallised the salt by forcing off the water. Therefore, each pan had its own individual furnace and chimney, which the lumpman was responsible for controlling. Wooden moulds were filled with salt crystals from the pans to produce a hard block (lump) of fine salt. Lumpmen were paid piecework, and would start at 3 or 4 in the morning, and could expect to work 12- to 16-hour days. Waller: A waller would be under the charge of the lumpman, and was responsible for the initial draining of the salt. Salt was drained by being raked to the side of the pans, and then transferred using skimmers onto the hurdle boards (walkways) around the pans. A waller is an ancient name for a saltmaker. He would have been hired on a daily basis. Fireman: In addition to the fine pans there were other 'common pans', used to make coarser salt. Because the production of common salt required slower burning fires, it was possible for a single fireman to have charge of several common pans, which could be up to 80 feet long. Pan-smith: This was originally the name given to the man who made the salt-making pans. A computation of the profit of making salt at Neath with Salt Water strengthened with Rock Salt……. …….. the Boyling Pans will make 10 or if required 15 Tun of Salt every week with a competent quantity of Rock Salt to heighten the brine and each Tun of Rock will produce for a Tun and a quarter to 2 Tun of White Salt according to the strength of the sea water with which it is mixed, which increase is called the outcast. Droitwich had it easier than Neath since there they were producing salt by the evaporation of brine springs which were ten times saltier than seawater. This made it more profitable since it did not need 'strengthening' with rock salt and the additional costs involved. 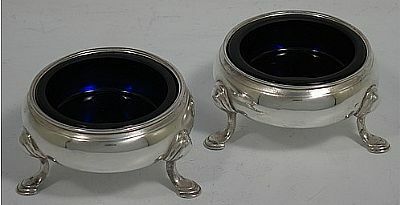 Incidentally, a salt cellar (also called a salt and a salt pig) is an article of tableware for holding and dispensing salt. They can be either lidded or open, and are found in a wide range of sizes, from large shared vessels to small individual dishes. Styles range from simple to ornate or whimsical, using materials including glass and ceramic, metals, ivory and wood, and plastic. The use of salt cellars is recorded as early as classical Rome. They continued to be used through the first half of the 20th century; however, usage began to decline with the introduction of free-flowing salt in 1911, and have been almost entirely replaced by salt shakers. Apart from those quoted above, further information may be found in the following documents also held at the WGAS.